The Malaria Awareness Campaign has warned that signs of the deadly disease should not be mixed up with those of common flu, after its latest survey revealed confusion over the symptoms. Britons planning to go abroad should also ensure that they have taken out medical travel insurance to cover themselves for the disease. Of the 2,254 people questioned as part of the survey, over half (57%) failed to identify malaria symptoms. The study followed recent figures which showed a near-30% rise in the number of malaria infections in the UK in the past two years. Dr George Kassianos, spokesman of Malaria Awareness Campaign, said: "The symptoms of malaria can be almost identical to those of common flu and can be non-specific, making it difficult for healthcare professionals to diagnose malaria early and accurately. "But if flu-like symptoms are coupled with history of travel to a malarious destination in the last 12 months, or sometimes even longer, it is essential that this infectious disease is ruled out. "Prevention is key and travellers should seek travel health advice six to eight weeks before they travel." 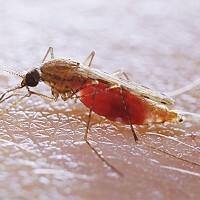 Symptoms of malaria include sweats and chills, muscle pains, headaches, a high temperature, coughing and diarrhoea.